Remember this poem from Lewis Carroll’s magnificent creativity Alice in Wonderland? The story has always intrigued me ever since I was a small kid. I loved the strange and absurd things that happens in the wonderland and the amazing creativity behind it that never failed to take me to my own wonderland, playing with Dinah and singing and dancing with bizarre characters from Wonderland. Oh yes!!! I grew up as a kid with wild imaginations, just like Alice. I laughed at absurdity and loved Alice’s curiosity and cheered her courage when faced with difficult phases. Carroll opened the new world, a wonderland, to me and made me see the beauty in the unknown. Coming back to present from my wonderland, I was singing “Beau--ootiful Soo-oop!“ while making Cream of Broccoli Soup and soon hubby dear joined me when slurping this warm and delicious bowl of soup. 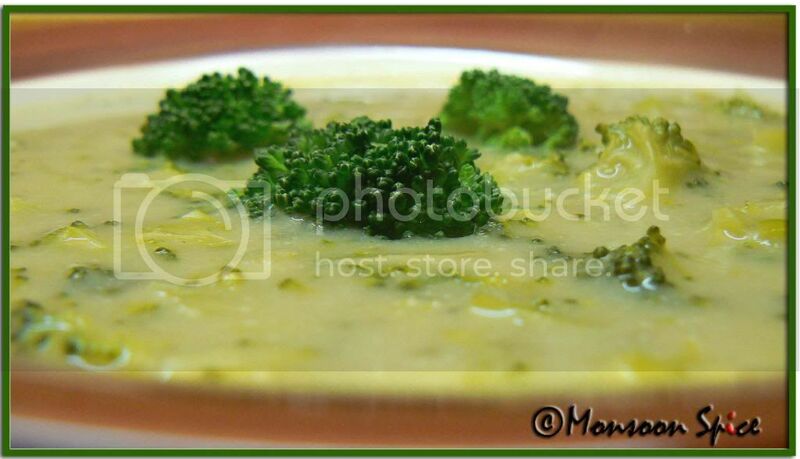 Simple soup with few ingredients and very little preparation needed is a joyous song to my soul ;) Little chunks of broccoli are simmered in hearty vegetable stock and milk and lightly flavoured with garlic and a peppercorn is sure to win everyone’s heart. When served with herbed garlic baguette it becomes one satisfying meal all together. Chop the broccoli head and stems to very fine pieces and keep them aside. Heat butter/oil in a pan and add finely chopped garlic flakes and sauté them till they turn light golden. Now add very finely chopped onions and sauté them for 2-3 minutes over a medium flame till the raw smell disappears and they turn light golden. To this add vegetable broth and finely chopped broccoli. Cover and cook for 10 minutes till the broccoli becomes tender. At this stage you can cool the stock completely and blend it into smooth puree without any lumps. Or else if you like some body to the soup and don’t mind the broccoli pieces like me continue the following steps. Add milk, salt and pepper to taste and simmer the flame. Keep stirring the soup for few more minutes so that the milk doesn’t curdle. Dissolve cornflour in ¼ cup of cold water without forming any lumps and pour slowly to the soup. Keep stirring the soup so that no lumps are formed. Add cream and simmer and cook for another 5-10 minutes till the soup thickens and bubbles are formed on the surface. Serve hot with garlic baguettes and enjoy. If you prefer thick soup then increase the amount of corn flour used. Adding fresh cream gives extra smoothness and body to the soup. Addition of cream is optional if you don't prefer heavy soups. simplicity of the prep'n and ingredients make me wanna try this at the earliest! MMMMMMMM....looks so comforting and creamy and delicious! :) I never really read alice in wonderland after school, must read it again and see. A lot of times, what seem to be childrens' tales, have a deeper meaning to them. This is my all time favorite soup, Sups! winter or summer, i am all for this one :-D. and to top it all, you are talking about Alice in the Wonderland! This post is so close to my heart, in every possible way :-D.
Yum Yum...I love creamy soups. Recently I tried this in a restaurant and did not like it when I had my first sip. But by the time I finished the bowl I fell in love with it that I skipped the dinner and went for another bowl. Thanks for sharing this recipe. Must try it for sure. Looks so delicious and comforting with that garlic bread on the side. hehehe! so u are a fan of Alice in Wonderland too!! love the Queen shouting ''off with her head'' and the duchess finding a moral in everything!! Love soups on winter days... this is the one soup I haven't tried yet. Great presentation as always. I tried COB soup once with milk+corn flour. Dint like it much. Heavy cream should do the trick, I guess. Soup looks lovely! Hey that looks so creamy with loadds of Broccoli...never tried brocoli before...should try this one sometime...Thanx for the recipe!! Your soup poem is beautiful just like your soup!!! Some how I never tried broccoli soup. 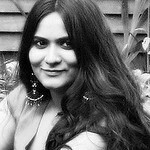 I use it a lot in curries, pasta and even stuffed parathas. Soup looks nice. Winter has started here and even I started making soups. After a long time I am visiting ur site..Oh my!Lot of changes and Ur blog became really beautiful..Loved everychanges u made...Creamy Soup looks deleicious!! Sia,loved Alice in the wonderland as a kid I think Levis Caroll is one of the best author, but I was major into detective kind of novels, used to love reading famous 5 ,Nancy Drew cannot even tell you how much I wanted to be like her when I grow up :). Sia..I had once tasted this soup in a restaurant in Singapore. I fell in love with its taste. Your recipe is tempting me to try it. Great Pics! I had read alot of books of Alice in Wonderland..but bleekily remember them. I need to go back and read them to tell some stories to my boy. Delicious looking soup... Comfort food for rainy and winter season..
Beautiful pic.. thanks for sharing. Just what I need right now, lovely bowl of soup...things have really cooled down, haven't they...as for 'Alice...',I loved the bit with the queen of hearts...really hilarious. Winter warmer it sure is. Simple ingredients and a quick winner. This looks delicious, think I'm going to skip the cream when I try it out this week - perfect soup for cold weather. Warm and delicious soup for the cold days ahead? Superb. The 2nd pic is too good..just adore those tiny broccoli heads emerging out of the soup. Thats a delicious bowl of soup. Thx for recipe. You know I have somehow never gotten around to have this soup, I don't know why but my inners cringe at the site of it and try as I might I just avoid it. Actually I have not even tried tasting it. this is one of my fav of favs soup. I have to make some at the weekend. Wow! !creamy and yummy!it's raining here!..and I am craving for that, my dear girl..
awesome pics!! m sure the soup tasted as gud as it looks. I love broccoli, though I don't cook at home, I have it when I go to restaurants. In any form it is always my favorite be it steamed, fresh in salad or in chinese noodles. I never had soup though, I will have to try this. It looks awesome. i will try this soup definetly. Great....My dear what a clear photo.....yummy!!! I have been meaning to try it, but never get around to it. Yours looks delicious Sups, will try your recipe... It's been ages since I read Alice in Wonderland... wonder if I have a copy! Gr8 soup and perfect for the cold weather. My goodness it looks so gorgeously yummy. I wish I has some now... it is sooo cold here in Norht London. 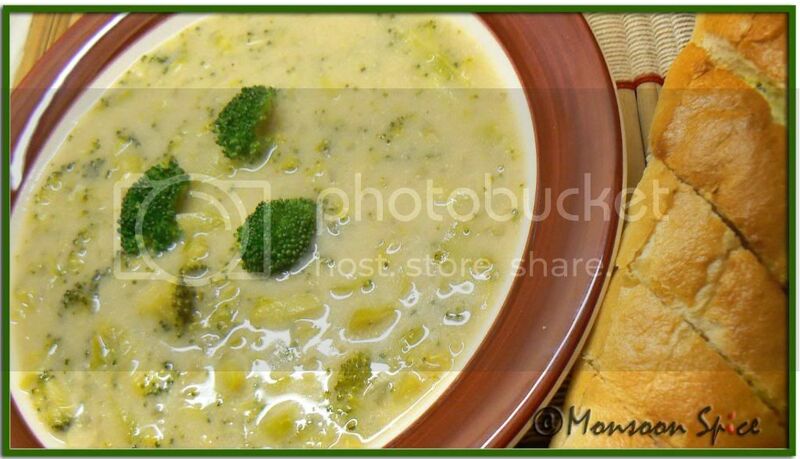 This is one of the best recipes ever for broccoli soup! I tried this one with great misgivings:I am not a huge fan of broccoli and other recipes in the past for this soup have proved disastrous! Keep up the good work- I love this recipe and I can't wait to make this soup again! 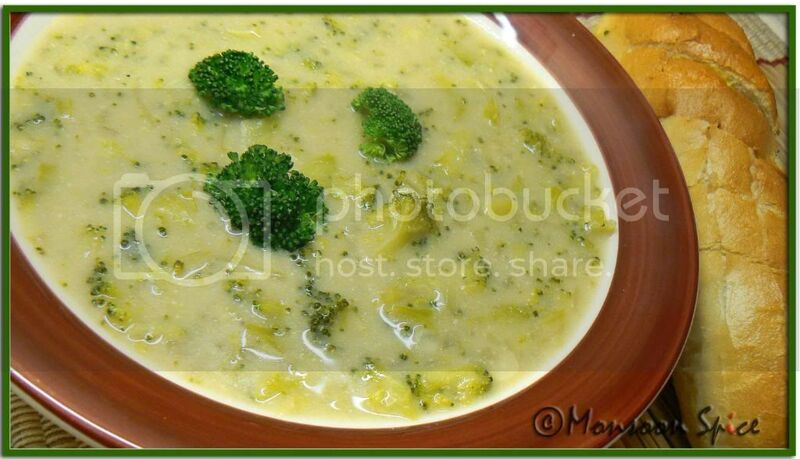 I want to try your recipe of cream of broccoli as my husband just loves it. Can u explain me what are they exactly? @Arthi, veg stock is the reserved water in which mixed vegs are cooked. I usually prepare them by cooking mixed vegetables with little seasonings and freeze it in containers. If u don't have time for making veg stock u can simply use stock cubes (veg, chicke, beef etc) or seasonings that are available in any supermarket under different brands like maggi, oxo, knor etc. just google search for veg stock cubes or recipe for preparing veg broth or stock at home. Thanks for this recipe..I used to make it without veg stock..just the cream, cornflour, roasted almond brocolli but adding veg stock made it rich in taste.